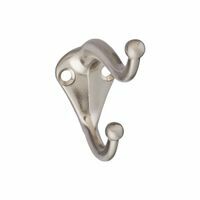 National Hardware Single Prong Robe Hook, Series: 1425, 3 in Overall Length, Zinc, Satin Chrome, Includes: Fasteners, Used Where a Single Hook or a Series of Single Hooks is Desired For use in bedrooms, bathrooms, closets and foyers. 2-7/8" upper hook projection. 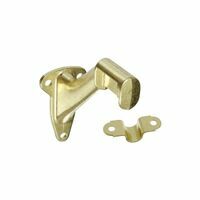 Includes fasteners for quick and easy installation. Screws included. Projection 2-5/16" lower hook, 2-15/16" upper hook, base 1-9/64"H x 1-23/32"W. Polybagged. Screws included. Projection 2-5/16" lower hook, 2-15/16" upper hook, base 1-9/64"H x 1-23/32"W. Polybagged. Screws included. Projection 2-5/16" lower hook, 2-15/16" upper hook, base 1-9/64"H x 1-23/32"W. Polybagged. Designed for use in bedrooms, bathrooms, closets and more. No fasteners needed - screw tip on wire. Safe working load 35 lbs. Bagged. Screws included. Projection 2-5/16" lower hook, 2-15/16" upper hook, base 1-9/64"H x 1-23/32"W. Polybagged. Economy handrail Includes screws. 3-1/4" projection. 2-15/16" base height. 3/4" x 2-3/8" clip. Accommodates 7/8" handrail. Polybagged. Packaged on pegable card. Hardware included. 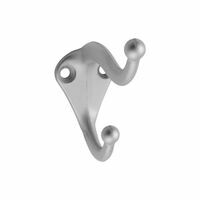 National Hardware Coat/Hat Hook, Series: MPB160, 2.35 in Height, 1.07 in Width, 2-3/4 in Length, 35 lb, 3 in Projection, Wall Mounting, 0.18 in Mounting Hole, 0.69 in Hole Spacing, Die Cast Zinc, Satin Nickel, For Use in Bedrooms, Bathrooms and Closets National Hardware Coat/Hat Hook, Series: MPB160, 2.35 in Height, 1.07 in Width, 2-3/4 in Length, 35 lb, 3 in Projection, Wall Mounting, 0.18 in Mounting Hole, 0.69 in Hole Spacing, Die Cast Zinc, White, For Use in Bedrooms, Bathrooms and Closets Designed for use in bedrooms, bathrooms, closets and more. 3" projection from the wall once installed. Fasteners included for installation Safe working load: 35 lbs. Visual-pack. Economy handrail Includes screws. 3-1/4" projection. 2-15/16" base height. 3/4" x 2-3/8" clip. Accommodates 7/8" handrail. Polybagged. Designed for use in bedrooms, bathrooms, closets and more. Extra heavy for added strength. Decorative ball tip design. Safe working load: 35 lbs. Visual-pack. Mounts to wall with screws included. 2-1/4" wide x 2" deep x 2-1/4" tall. Mounts to wall with screws included. 2-1/4" wide x 2" deep x 2-1/4" tall. Mounts to wall with screws included. 2-1/4" wide x 2" deep x 2-1/4" tall. Economy handrail Includes screws. 3-1/4" projection. 2-15/16" base height. 3/4" x 2-3/8" clip. Accommodates 7/8" handrail. Polybagged. 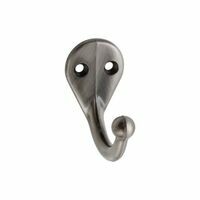 National Hardware Coat/Hat Hook, Decorative, Heavy Duty, Series: V160, 2.35 in Height, 1.07 in Width, 35 lb, 2-3/4 in Projection, Wall Mounting, 0.18 in Mounting Hole, 0.69 in Hole Spacing, Die Cast Zinc, Satin Chrome, Includes: Fasteners, For Use in Bedrooms, Bathrooms and Closets Designed for use in bedrooms, bathrooms, closets and more. Extra heavy for added strength. Decorative ball tip design. Safe working load 75lbs. Visual-pack. Designed for use in bedrooms, bathrooms, closets and more. 3" projection from the wall once installed. Fasteners included for installation Safe working load: 35 lbs. Visual-pack. Designed for use in bedrooms, bathrooms, closets and more. 3" projection from the wall once installed. Fasteners included for installation Safe working load: 35 lbs. Visual-pack. 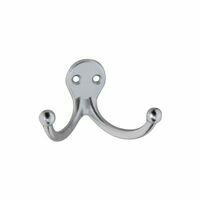 National Hardware Cloth Hook, Heavy Duty, Series: V163, 1.73 in Height, 2.88 in Length, 35 lb, 1.76 in Projection, 2 Hooks, Wall, Door Mounting, 0.14 in Mounting Hole, Fasteners: Screws, Die Cast Zinc, Satin Chrome, For Use in Bedrooms, Bathrooms and Closets Designed for use in bedrooms, bathrooms, closets and more. Extra heavy for added strength. Decorative ball tip design. Safe working load: 35 lbs. Visual-pack. Designed for use in bedrooms, bathrooms, closets and more. Extra heavy for added strength. Decorative ball tip design. Safe working load: 35 lbs. Visual-pack. Secures wooded handrail to wall, stud or other structurally sound surface. Bracket and strap are design to adjust to any stairway angle. Maximum distance between brackets not to exceed 48 inches. Safe working load: 250 lbs. Visual-pack. Secures wooded handrail to wall, stud or other structurally sound surface. Bracket and strap are design to adjust to any stairway angle. Maximum distance between brackets not to exceed 48 inches. Safe working load: 250 lbs. Visual-pack. Designed for use in bedrooms, bathrooms, closets and more. Extra heavy for added strength. Decorative ball tip design. Safe working load 75 lbs. Designed for use in bedrooms, bathrooms, closets and more. Extra heavy for added strength. Decorative ball tip design. Safe working load 75lbs. Visual-pack. Designed for use in bedrooms, bathrooms, closets and more. Extra heavy for added strength. Decorative ball tip design. Safe working load 75lbs. Visual-pack. Designed for use in bedrooms, bathrooms, closets and more. Extra heavy for added strength. Decorative ball tip design. Safe working load 75lbs. Visual-pack. Designed for use in bedrooms, bathrooms, closets and more. Extra heavy for added strength. Decorative ball tip design. Safe working load 75lbs. Visual-pack. Designed for use in bedrooms, bathrooms, closets and more. 3" projection from the wall once installed. Fasteners included for installation Safe working load: 35 lbs. Visual-pack. Designed for use in bedrooms, bathrooms, closets and more. 3" projection from the wall once installed. Fasteners included for installation Safe working load: 35 lbs. Visual-pack. National Hardware Handrail Bracket, Series: MPB112, 3.31 in Length, 1.43 in Width, 250 lb Load Capacity, 3 Mounting Holes, Fasteners: (3) NO 10 Oval Head Wood Screws, Die Cast Zinc Body, Steel Strap, White, For Securing Wooded Handrail to Wall, Stud or Other Structurally Sound Surface Economy handrail Includes screws. 3-1/4" projection. 2-15/16" base height. 3/4" x 2-3/8" clip. Accommodates 7/8" handrail. Polybagged. National Hardware Coat/Hat Hook, Heavy Duty, Oval Head, Series: V166, 3.302 in Height, 0.837 in Width, 75 lb, 2-1/2 in Projection, Door, Wall Mounting, 0.626 in Hole Spacing, Fasteners: (2) NO 8 x 1 in Screws, Die Cast Zinc, Nickel Plated, For Use in Bedrooms, Bathrooms and Closets Designed for use in bedrooms, bathrooms, closets and more. Extra heavy for added strength. Decorative ball tip design. Safe working load 75lbs. Visual-pack. Secures wooded handrail to wall, stud or other structurally sound surface. One piece, single screw design. Safe working load: 250 lbs. Designed for use in bedrooms, bathrooms, closets and more. Extra heavy for added strength. Decorative ball tip design. Safe working load 75lbs. Visual-pack. Designed for use in bedrooms, bathrooms, closets and more. Extra heavy for added strength. Decorative ball tip design. Safe working load 75lbs. Visual-pack. Secures wooded handrail to wall, stud or other structurally sound surface. Bracket and strap are design to adjust to any stairway angle. Maximum distance between brackets not to exceed 48 inches. Safe working load: 250 lbs. Visual-pack. Secures wooded handrail to wall, stud or other structurally sound surface. Bracket and strap are design to adjust to any stairway angle. Maximum distance between brackets not to exceed 48 inches. Safe working load: 250 lbs. Visual-pack. Economy handrail Includes screws. 3-1/4" projection. 2-15/16" base height. 3/4" x 2-3/8" clip. Accommodates 7/8" handrail. Polybagged. 2-1/4" x 1-3/8" base. 2-7/16" base to center of rail. Economy handrail Includes screws. 3-1/4" projection. 2-15/16" base height. 3/4" x 2-3/8" clip. Accommodates 7/8" handrail. Polybagged. Designed for use in bedrooms, bathrooms, closets and more. Fastenes underneath the shelf. Decorative ball tip design. Safe working load 35lbs. Visual-pack. Designed for use in bedrooms, bathrooms, closets and more. Extra heavy for added strength. Decorative ball tip design. Safe working load: 35 lbs. Mini-pack bagged. Designed for use in bedrooms, bathrooms, closets and more. Extra heavy for added strength. Decorative ball tip design. Safe working load: 35 lbs. Mini-pack bagged. Designed for use in bedrooms, bathrooms, closets and more. Extra heavy for added strength. Decorative ball tip design. Safe working load 75 lbs. Designed for use in bedrooms, bathrooms, closets and more. Extra heavy for added strength. Decorative ball tip design. Safe working load 75 lbs. Protective clear lacquer coating. Corrosion resistance. Safe working load 35 pounds. Decorative ball tip design. Designed for use in bedrooms, bathrooms, closets and more. Extra heavy for added strength. Decorative ball tip design. Safe working load: 35 lbs. Mini-pack bagged. Designed for use in bedrooms, bathrooms, closets and more. Extra heavy for added strength. Decorative ball tip design. Safe working load: 35 lbs. Mini-pack bagged. Designed for use in bedrooms, bathrooms, closets and more. Extra heavy for added strength. Decorative ball tip design. Safe working load: 35 lbs. Mini-pack bagged. Designed for use in bedrooms, bathrooms, closets and more. Fastenes underneath the shelf. Decorative ball tip design. Safe working load 35lbs. Visual-pack. Designed for use in bedrooms, bathrooms, closets and more. Fastenes underneath the shelf. Decorative ball tip design. Safe working load 35lbs. Visual-pack. 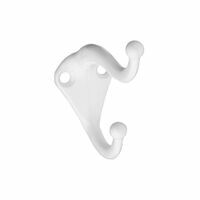 National Hardware Garment Hook, Heavy Duty, Oval Head, Series: V167, 4.59 in Height, 1.02 in Width, 35 lb, 3.575 in Projection, Door, Wall Mounting, 0.128 in Mounting Hole, 0.626 in Hole Spacing, Fasteners: (2) NO 8 x 1 in Screws, Die Cast Zinc, Nickel Plated, For Use in Bedrooms, Bathrooms and Closets National Hardware Garment Hook, Heavy Duty, Oval Head, Series: V167, 4.59 in Height, 1.02 in Width, 35 lb, 3.575 in Projection, Door, Wall Mounting, 0.128 in Mounting Hole, 0.626 in Hole Spacing, Fasteners: (2) NO 8 x 1 in Screws, Die Cast Zinc, Satin Chrome, For Use in Bedrooms, Bathrooms and Closets Designed for use in bedrooms, bathrooms, closets and more. Extra heavy for added strength. Decorative ball tip design. Safe working load: 35 lbs. Mini-pack bagged. 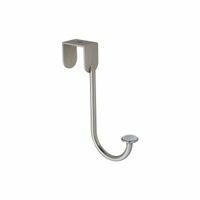 National Hardware Door Hook, Series: V168, 35 lb, 3 in Projection, Die Cast Zinc, Satin Nickel, For Hanging Laundry, Dry-cleaning and Ironing Designed for use in bedrooms, bathrooms, closets and more. Decorative porcelain knob tip. With ceramic insert. Safe working load: 35 lbs. Secures wooded handrail to wall, stud or other structurally sound surface. Bracket and strap are designed to adjust to any stairway angle. Maximum distance between brackets not to exceed 48 inches. Mini-pack bagged. Secures wooded handrail to wall, stud or other structurally sound surface. One piece, single screw design. Safe working load: 250 lbs. Secures wooded handrail to wall, stud or other structurally sound surface. One piece, single screw design. Safe working load: 250 lbs. Secures wooded handrail to wall, stud or other structurally sound surface. One piece, single screw design. Safe working load: 250 lbs. Secures wooded handrail to wall, stud or other structurally sound surface. One piece, single screw design. Safe working load: 250 lbs. 2-1/4" x 1-3/8" base. 2-7/16" base to center of rail. 2-1/4" x 1-3/8" base. 2-7/16" base to center of rail. 8.75" x 4" x 7". Boxed. National Hardware Coat/Hat Hook, Decorative, Heavy Duty, Series: V8009, 5-1/2 in Height, 2.501 in Projection, 2 Hooks, Wall Mounting, 0.945 in Hole Spacing, Fasteners: NO 8 Oval Head Screw, Die Cast Zinc, White, For used to hang garments in the home Used to hang large or heavy articles of clothing. Includes fasteners. Safe working load 75 lbs. Visual-pack. Hardware included. Carded. Secures wooded handrail to wall, stud or other structurally sound surface. Bracket and strap are design to adjust to any stairway angle. Maximum distance between brackets not to exceed 48 inches. Corrosion resistance. Safe working load 250 lbs. Visual-pack. Size: 18" X 5/8" X 2.75". Ideal for use in entryways, bedrooms, closets and laundry rooms. Wood nubs included to conceal mounting screws. Fasteners and anchors included. Ideal for use in entryways, bedrooms, closets and laundry rooms. Wood nubs included to conceal mounting screws. Fasteners and anchors included. All-purpose hook in traditional design. Base: 1-3/4?H x 1-1/4?W, Projection: 3?. Slim pak - polybagged. All-purpose hook in traditional design. Base: 1-3/4?H x 1-1/4?W, Projection: 3?. Slim pak - polybagged. Ideal for closet, bathroom, kitchen, laundry room storage and organization; fits on a 1-3/8" thick door. Ideal for closet, bathroom, kitchen, laundry room storage and organization; fits on a 1-3/8" thick door. Ideal for closet, bathroom, kitchen, laundry room storage and organization; fits on a 1-3/8" thick door. Compact hook is perfect where space is limited, such as behind doors where low profile is needed. Base: 1-1/4?H x 1-1/4?W. Projection: 1-5/8?. Slim pak - polybagged. Ideal for use in entryways, bedrooms, closets and laundry rooms. Wood nubs included to conceal mounting screws. Fasteners and anchors included. Ideal for use in entryways, bedrooms, closets and laundry rooms. Wood nubs included to conceal mounting screws. Fasteners and anchors included. Ideal for use in entryways, bedrooms, closets and laundry rooms. Wood nubs included to conceal mounting screws. Fasteners and anchors included. Used to hang garments in the home.Extra heavy for added strength. Decorative "C" hook design. Double hook, featuring an "upscale" design. Large 5". Used to hang garments in the home.Extra heavy for added strength. Decorative "C" hook design. Double hook, featuring an "upscale" design. Large 5". Used to hang garments in the home.Extra heavy for added strength. Decorative "C" hook design. Double hook, featuring an "upscale" design. Large 5". Used to hang garments in the home.Extra heavy for added strength. Decorative "C" hook design. Double hook, featuring an "upscale" design. Large 5". Used to hang garments in the home.Extra heavy for added strength. 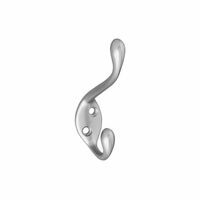 Decorative "C" hook design. Double hook, featuring an "upscale" design. Large 5". Projection: 1-1/8". Slim pak - polybagged. Used to hang garments in the home. Extra heavy for added strength. Featuring an "upscale" design. 3? Length. Used to hang garments in the home. Extra heavy for added strength. Featuring an "upscale" design. 3? Length. Used to hang garments in the home. Extra heavy for added strength. Featuring an "upscale" design. Large 5-1/2?. Used to hang garments in the home. Extra heavy for added strength. Featuring an "upscale" design. Large 5-1/2?. Used to hang garments in the home. Extra heavy for added strength. Featuring an "upscale" design. Large 5-1/2?. Used to hang garments in the home. Extra heavy for added strength. Featuring an "upscale" design. Large 5-1/2?. Used to hang garments in the home. Extra heavy for added strength. Featuring an "upscale" design. Large 5-1/2?.